Cooking for the family is for sure a lot of fun, but when it comes to oven cleaning, you’d better leave this job to the professionals. We will remove all the accumulated burned grease out even on the most hard-to-reach spots. 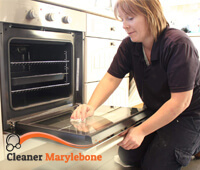 Our company offers you domestic oven cleaning services in the area of Marylebone at the most competitive prices rates you will find. Our experienced cleaners will remove all the grease using only biodegradable chemicals that are safe for your health. Because we are located in the Marylebone area, we guarantee that the cleaners will be on your doorstep the same day you call. They will be fully equipped with professional tools and detergents and can start working immediately without wasting any of both their and your time. We are a company with strong family values that’s why we use only non – toxic, safe to use cleaning detergent. When using your oven on a regular basis, there will be a lot of burner grease both inside the oven and on the hob. That grease produces very strong and unpleasant odour that spreads all around the kitchen and the house. Also, when you cook in the oven, your food will absorb that odour and every dish will smell the same. For these reasons, most oven manufacturers recommend professional cleaning at least once a year. When cleaning heavy burned grease we are using a container full of eco – friendly chemical solution that helps breaking down the grease and the removing it completely. We also can remove the door of the oven and separate the glass to clean inside. The hob and the interior of the oven are then scrubbed with professional tools to bring back that brand new look. Our company specialises in various domestic cleaning services and oven cleaning in particular. 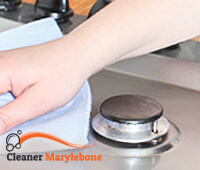 We are responsible for hundreds perfectly cleaned ovens all over the Marylebone area. Don’t forget to ask for your free quote today!